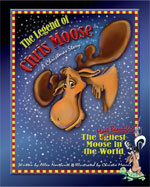 Author Allen Northcutt's fun-filled holiday tale weaves a whimsical 'ugly duckling' story of animal friends that love an amiable but tattered moose whose name is 'Ugly'. Authors Jeryl Abelmann and Miriam Kronish bring the enchanting story of Quickly The Magic Spatula to life. This warm childhood memory describes a touching family story. Award winning authors Miriam Kronish and Jeryl Abelmann once again bring their character Quickly The Magic Spatula to life. Quickly's wish is to have a magical pancake adventure—to go out into the world in search of pancake recipes far and wide. This book blends Quickly's adventure with a treasure trove of delicious pancake recipes.